The ruffled drop waist style of this shimmery lace and sequin dress make it perfect for twirling! Pretty pearl trims add extra elegance at the neck and waist. 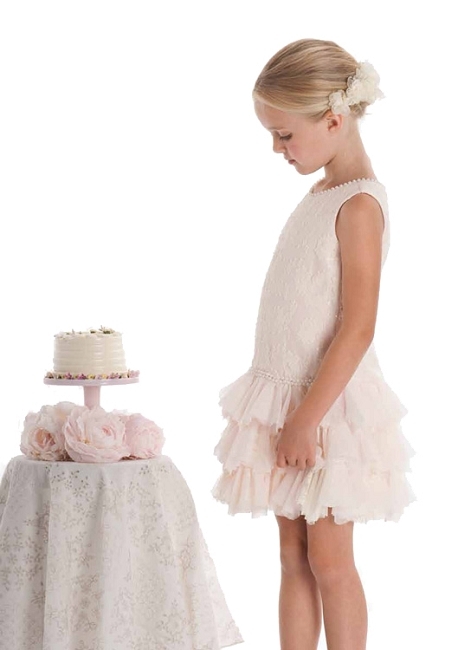 Biscotti Dress- She will shine in this ivory lace dress that is layered over a soft pink lining and shimmering sequins The dropped torso is embellished with a row of pearls and a tiered netting and lace skirt The neckline is finished with a pearl "necklace"